Victor Soto has comes up with a new concept, called the iRing that enables users to control playback and volume on any of the Apple media products. The stylish iRing features a wireless Bluetooth connectivity that allows the iPod and iPhone consumer to operate their devices with ease. It also sports a bright OLED status display with touch-sensitive function strip and a rechargeable battery that offers a life of up to 2 days. 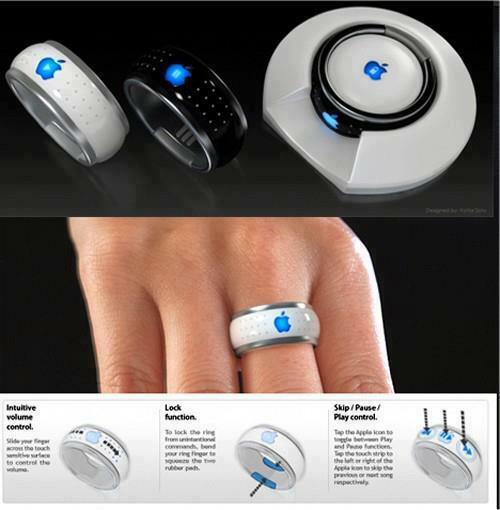 A cradle helps you to recharge the iRing and a locking feature allows you to lock the controls on the back of the ring.